Cells seeded onto standard tissue culture plates grow in two dimensions, whereas cells in the body grow three dimensionally. To better mimic in vivo cell growth and behavior, 3D Biotek develops and sells three-dimensional (3-D) scaffolds for cell culture work. Researchers are using the 3-D scaffolds for drug screening, tissue engineering, and stem cell research. While working at another biotechnology company, Qing Liu, Ph.D., searched for scaffolds for cell culture experiments but could not find satisfactory commercial products with well-controlled pore sizes and structures. “That’s how I got the idea to start 3D Biotek; I wanted to make our own,” says Dr. Liu, CEO. He started the company in 2007 with Wing Lau, Ph.D., COO. The three-year-old company is already attracting attention. The National Institute of Standards and Technology recently selected its 96-well compatible 3-D polycaprolactone (PCL) scaffolds as the standard reference tool for the development of 3-D scaffold-based products. Compared to two-dimensional (2-D) scaffolds, cells growing on 3-D scaffolds have significantly more viability, increased extracellular matrix secretion, and longer proliferation periods, Dr. Liu says. Because the scaffolds resemble the cell growth environment of the human body, cells growing on them give more physiologically relevant results, he adds. The tiny connected pores allow nutrients and waste products to be efficiently obtained and eliminated. The scaffold materials are transparent, so cells can be viewed with an inverted light microscope and fluorescent microscopy. The company offers two types of scaffolds made from either polystyrene, a polymer used in traditional cell culture plates, or PCL, a biodegradable polymer used in many FDA approved implants, drug delivery devices, and sutures. PCL is also widely used for tissue-engineering research involving bone/cartilage, tendon/ligament, liver, nerve, skin, and cardiovascular cells. All scaffolds are made from animal-free materials, and no cytotoxic organic solvents such as chloroform are used in fabricating them. The 3-D precision microfabrication technology reportedly guarantees uniform pore size throughout a scaffold, ranging from 200 to 500 microns. 3D Biotek’s microfabrication technology insures the reproducibility of the porous structures from batch to batch, Dr. Liu explains. The company also offers services to customers who want to fabricate biomedical devices with controlled internal porous structures. 3D Insert™, the first product line commercialized by 3D Biotek, is a series of porous devices for cell and tissue culture applications. All 3D Inserts have increased surface area compared to 2-D cell culture plates, so more cells can reportedly be cultured in the same size dish, plate, flask, or bioreactor. Additionally, the 3D Inserts do not absorb cytokines and growth factors commonly secreted by cultured cells. This makes it easier to recover desired products from culture media without extensive separation steps. The 3D Inserts are prepackaged into wells of tissue culture plates or custom fitted into bioreactors. 3D Inserts are ideal for early drug screening of oncology and other drugs in cell cultures. Researchers generally evaluate drug efficacy in 2-D petri dishes. “But cancer cells prefer to grow in 3-D environments, and 2-D cell culture methods are not a reliable model for tumor cells,” says Dr. Liu. Therapeutic agents, such as tamoxifen tested on MCF-7 human breast cancer cells, give more realistic results in 3-D cultures than 2-D cultures, according to experiments performed at 3D Biotek. 3D Inserts also meet the needs of stem cell researchers. “The promise of stem cells is that they have the potential to become all kinds of tissue,” says Dr. Liu, and a 3-D scaffold helps them to differentiate into various types of cells. The same concept applies to tissue-engineering research where specific tissue types grow better in a 3-D environment. A second product, the 3D Cell Transfection Kit, increases transfection efficiency, Dr. Liu notes. The kit was co-developed with BioCellChallenge (www.biocellchallenge.com) and is based on a 3-D in vitro transfection technology that achieves high delivery efficiencies of plasmid DNA, Dr. Liu says. The kit contains a sterile plate with 3-D scaffolds and a special reagent that’s optimized to transfect cells growing in physiological tissue environments. As a proof-of-concept of the kit’s potential, HEK293T cells were transfected and showed a prolonged increase of IL-2 cytokine secretion that was about 10-fold higher than a 2-D control system. Bioactive scaffolds are also being developed to improve tissue engineering, such as bone and cartilage repair. When cells grow on scaffolds, they lay down their own cellular matrix that secretes needed growth factors. The porous scaffold structure can be optimized to promote the cellular matrix, and growth factors and other agents can be added to simulate natural morphogenesis. 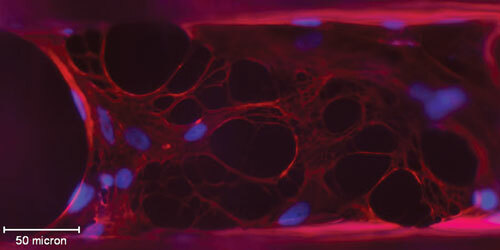 Researchers worldwide contact 3D Biotek to ask about using 3-D scaffolds in novel ways. Currently, however, the company does not have the resources to pursue the ideas. “But we can provide our scaffolds to others who want to develop protocols for other applications,” Dr. Liu says.